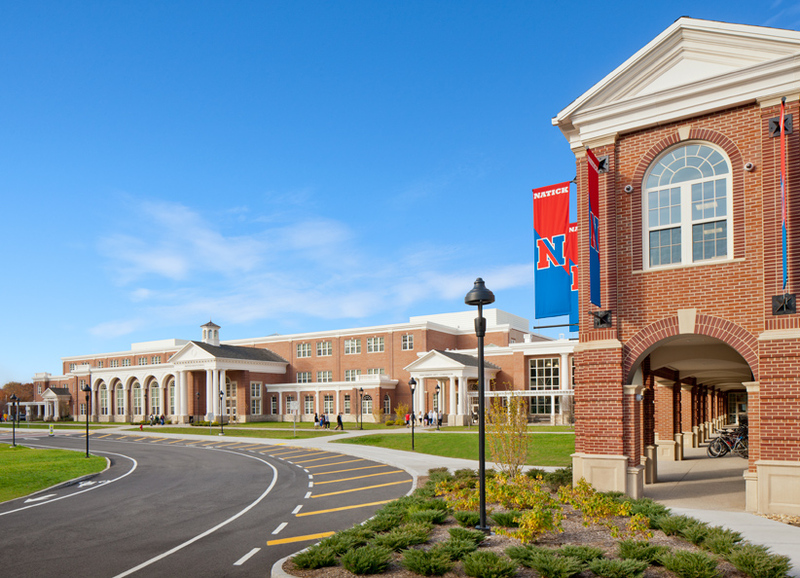 The New Natick High School, designed in a Greek Revival style with focus on the Tuscan Order, is inspired by a handful of historic buildings which serve as icons within the Natick Town Center. Its unique site location on the edge of Dug Pond allows the new school to serve as a true community facility by offering residents the use of walking trails and paths at the edge of Dug Pond, views to Dug Pond Beach, a new 3,500 sq ft two story fitness center, pre-kindergarten and child development classrooms, indoor three lane jogging track, and a community-use performing arts center and drama space. The glass exterior wall at the fitness center allows expression of the active and health-conscious activities occurring within the building's interior both day and night. The new high school will be LEED Certified Gold, setting a very high standard for green and sustainable excellence.